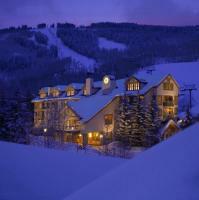 Here are the top hotels for your Beaver Creek ski trip! Housed in a chalet-style building next to a ski lift, this ski-in/ski-out, high-end hotel is in the center of the Beaver Ski Resort village. The modern rooms offer mountain views and have free Wi-Fi, flat-screen TVs with DVD players and MP3 docks; some have fireplaces. The penthouse suite adds a kitchen and private balconies. Amenities include a fireside grill restaurant, and a heated outdoor pool with a hot tub and poolside bar. There's also a fitness room with a sauna. Free ski shuttle service and heated underground valet parking are available. A 12-minute walk from Elkhorn Lift 14 at Beaver Creek Mountain, this upscale ski-in/ski-out resort is 13 miles from Vail Village. All of the hotel rooms and condos have free Wi-Fi, flat-screen TVs, and iPod docks, plus minifridges, coffeemakers and bootwarmers. Upgraded rooms add balconies with mountain views. Condos add kitchens, balconies, hot tubs, fireplaces and washer/dryers. Seasonal amenities are offered, including a heated outdoor pool and hot tub, plus a fitness room. Free ski storage and on-site ski rental (fee) are available. 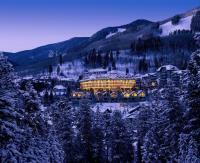 Set 2.7 miles from Avon, this high-end Rocky Mountain resort and spa is also 12.8 miles from Vail. The polished rooms and suites include free Wi-Fi, flat-screen TVs and minifridges. Suites offer features such as fireplaces, kitchenettes and whirlpool tubs, as well as additional bedrooms and separate living areas with pull-out sofas. There's a cafe and 3 restaurants serving a variety of cuisine, plus a year-round heated outdoor pool and 5 hot tubs. Other amenities include an outdoor fire pit, a fitness center and a full-service salon and spa.